What is the MediPen® and how can it benefit me? The MediPen® Cannabinoid Vaporizer is the slick, stylish and completely legal way to enjoy using cannabinoids. Simply inhale from your MediPen® and instantly enjoy our proprietary cannabinoid formula, delivered through a cloud of delicious, silky smooth vapour. There are over 114 fascinating compounds found in the cannabis plant, known as cannabinoids responsible for a range of different effects. CBD, CBDV and CBG are completely non-psychoactive and do not produce any negative mind altering effects. What’s inside the MediPen® Cannabinoid Vaporizer? We extract our non-psychotropic cannabinoid extracts from cutting-edge strains of the cannabis plant grown in the US & EU. This enables us to create our natural cannabinoid rich formula found in every MediPen® cartridge using only the highest quality raw plant matter available. We use only the highest quality cannabinoid extracts combined with Pharmaceutical Grade Coconut Oil to produce our extremely potent signature gold blend formula found in every MediPen® cartridge. After undergoing the final triple vacuum filtration process, we encapsulate our high-strength formula into our cutting edge vaporizer device, to heat it to its optimal temperature and produce a cloud of delicious, silky smooth vapour. We work closely with a local team of production and regulatory support pharmacists to analyse each batch of our formula for cannabinoid concentration, residual solvents and contaminants. Lab results available on request. With thousands of active users across the UK alone the MediPen® Cannabinoid Vaporizer is without a doubt one of the most popular cannabinoid products in the world. But don't just take our word for it, take a look at our extremely positive user feedback and press coverage and find out what makes the UK's trusted Cannabinoid Vaporizer! What is the MediPen® Cannabinoid Vaporizer and how can it benefit me? The MediPen® Cannabinoid Vaporizer is the slick, stylish and completely legal way to enjoy using cannabinoids. 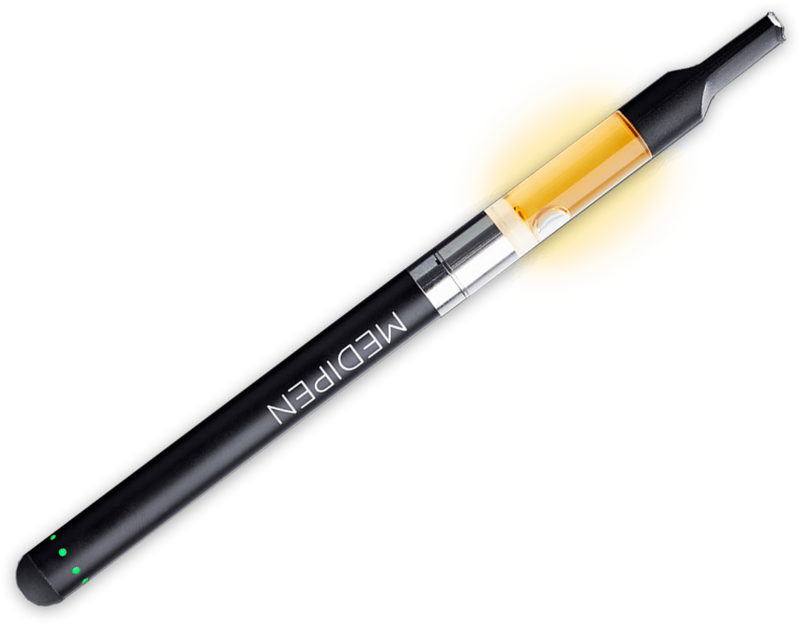 The MediPen® Cannabinoid Vaporizer is the first all-natural CBD, CBDV & CBG infused vaporizer pen to be sold in the UK. Easy to use. No buttons. No fuss. Simply inhale from your MediPen® vape mouthpiece and instantly enjoy our proprietary cannabinoid-rich formula, delivered through a cloud of delicious, silky smooth vapour. We use only the highest quality legal non-psychoactive cannabinoid extracts combined with Pharmaceutical Grade Coconut Oil (designed for safe inhalation) to produce our proprietary signature gold blend formula. Our natural extracts are sourced from cutting-edge strains of the cannabis plant grown in the US and EU grown specifically to maximise the presence of non-psychotropic legal cannabinoids. This enables us to create our powerful, natural formula found in every MediPen® using only the highest quality raw plant matter available, unlike other cannabinoid products which generally use inferior parts of the hemp plant such as stalks and seeds to create a much weaker blend. There are over 114 fascinating compounds found in the cannabis plant known as cannabinoids responsible for a range of different effects. All humans and mammals have what’s known as the endocannabinoid system in their bodies, consisting primarily of the CB1 and CB2 receptors, operating in the central and peripheral nervous systems respectively. Each one of these cannabinoids serves a unique purpose, however the two most acknowledged cannabinoids are currently CBD (Cannabidiol) and THC (Δ9-Tetrahydrocannabinol). Unlike THC, the primary psychoactive component found in cannabis, the cannabinoids we work with (CBD, CBDV & CBG) do not induce any negative mind-altering effects as they do not interact with the same neurological pathways as THC. What are the effects associated with Cannabinoids? With over 15,000 peer-reviewed scientific studies demonstrating the powerful therapeutic effects of both non-psychotropic and psychoactive cannabinoids, the medicinal cannabis revolution has gained significant traction over the past few decades. Each cannabinoid is responsible for a variety of different effects, and we highly recommend conducting your own research if you’re interested in learning more. Most identified cannabinoids also show great promise for their therapeutic benefits due to having few known interactions with any drugs and no physical dependency or withdrawal symptoms. For the last two decades, cannabis has been cultivated for higher amounts of THC, ideal for the recreational user. However, as more & more research is conducted we are now able to grow cannabis strains low in THC and rich in other legal non-psychoactive cannabinoids, which have been shown to have a wide range of potential applications. Is the MediPen® Cannabinoid Vaporizer legal? The MediPen® Cannabinoid Vaporizer is completely legal in the UK as it does not contain any THC, the cannabinoid scheduled as a Class B substance under the UK Misuse of Drugs Act 1971. CBD, CBDV & CBG have no psychoactive effects and are not subject to any legal restrictions on their import, sale, possession or use, so now anyone can enjoy using non-psychotropic cannabinoids in a safe & legal way! Can I use the MediPen® Cannabinoid Vaporizer anywhere? The MediPen® Cannabinoid Vaporizer is a sleek and stylish portable handheld device that is completely odourless and discreet, enabling you to use it comfortably in any environment you like. Simply inhale through the mouthpiece to activate the MediPen® Cannabinoid Vaporizer and enjoy a delicious cloud of delicious silky smooth vapour. The MediPen® vape is perfectly suited for people with active lifestyles, and can be used as much as you like without interfering with your day-to-day activities. How does the MediPen® Cannabinoid Vaporizer work? With our stylish buttonless design, all you have to do is simply inhale through the mouthpiece to activate the rechargeable MediPen® battery. This will in turn gently heat up our signature gold blend formula and convert it to an all natural cloud of silky smooth vapour. At the base of the MediPen® vape pen there is a green LED light which will automatically illuminate as you draw through the mouthpiece. Once the battery is fully depleted, the LED light will flash three times. To recharge, simply screw the USB adapter onto the base of your MediPen® battery and plug into any USB power source. The charger LED will illuminate green once complete. Is the MediPen® Cannabinoid Vaporizer safe? We’re certain the MediPen® is completely safe due to its all natural ingredients and strict quality control measures. However, to be on the safe side we don’t recommend that it be used by pregnant or breastfeeding women, anyone suffering from chronic heart conditions, diabetes, high blood pressure or anyone under the age of 18. CBD, CBDV and CBG do not affect physiological parameters, and the MediPen® Cannabinoid Vaporizer should not be considered a medical device nor is it intended to treat or cure any disease or illness. Whilst we pride ourselves on our knowledge in the field of cannabis biochemistry, we are not medical professionals and not qualified to give medical advice. Please be sure to always consult your GP if you have any concerns about using legal cannabinoids. Our primary objective as a company is to promote the positive attributes of the cannabis plant. Through raising awareness and working together we can reform cannabis laws in this country, and we aim to offer everyone the resources they require to become experts on cannabinoids themselves. We aim to disrupt the crowded vaporizer market and provide a safe & legal way to take enjoy using legal cannabinoids. As the industry leaders in the UK market we're excited to be at the forefront of the cannabis revolution here in the UK and pave the way for more pharmaceutical companies to develop licensed cannabis based medicines utilizing our extensive public research. Our friendly support team are available to help you every step of the way, 24 hours a day, 7 days a week.